Guess what releases on April 1?! And this is no April Fools joke, it's the Pretty & Polished Algebraic Addition Collection!!! Unfortunately, I don't watch Adventure Time, but after looking up all of these silly names and pictures, I feel like I need to check this show out!! So if you are like me and don't know as much about the show, I included pictures to help show what the polishes were inspired after! :-) I think Chels, the owner, did a fantastic job bringing this show based collection to life! It is on Cartoon Network on Monday's at 6:30 p.m. (not sure what time zone that is) and you can find out more about the characters HERE! So this will be a large post!! Are you ready?! Up first, we have Candy Reign. For Candy Reign, I used 2 coats with Clearly on Top by KBShimmer. 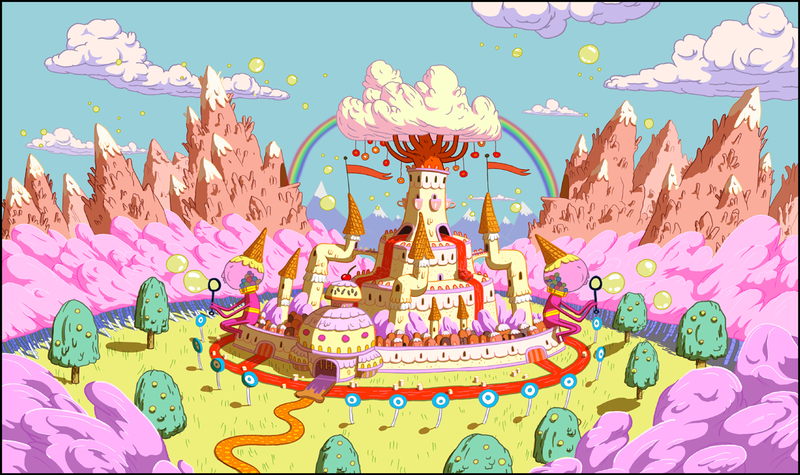 Chels describes it: The Candy Kingdom is the place to be in the Land of Ooo! You will find all sorts of sweet treats and pretty colors in the Candy Kingdom as well as in our polish "Candy Reign". Feast your eyes on a light pink creme packed with sweet neons and fun shapes! Close up! Love that shimmer and all the fun glitters! Next, we have Watch it in CD! For this mani, I started with two coats of OPI Rumble's Wiggin'. I added one coat of Watch it in CD with Wicked Fast top coat by Cult Nails. Chels describes it: Watch it in CD is a gorgeous glitter polish packed full of the most beautiful pink and purple glitters and looks just like the Crystal Dimension! The perfect full coverage glitter for any Adventure Time fan! This is such a gorgeous glitter mix! For this mani, I used 2 coats of Whatevers 2009 with Clearly on Top by KBShimmer. Chels describes it: In case you are planning a trip to Lumpy Space you may want to remember the name of the polish, "Whatevers 2009". You see, that is the password to gain access to this beautiful purple kingdom. You will find all the gorgeous colors of Lumpy Space packed into this one glorious polish. Purples, blues, greens, and a sprinkling of "Night sky Holo dust". Close up! LOVE the star!! I think this one is my favorite, but it's really hard to choose because they are all great! This is called 7 Year Lich. For this mani, I started with two coats of Zoya Dove. I then applied 1 coat of 7 Year Lich with Clearly on Top by KBShimmer. I just love how the flakes shine! They are stunning! And the black hexes and diamonds, along with the tiny silver hexes are so cool looking together with the flakies! I love it over the light grey! Chels describes it: 7 Year Lich is a dark and somewhat magical polish. At first glance it looks dark and dreary but put it on and you will find it is filled with trickery just like the Lich from Adventure Time! Close up! See how the flakes reflect the light!? Next, we have Incinerate My Heart. Chels describes it: Incinerate My Heart portrays the hot love that Flame Princess once had for Finn. You will find this Hot Orange Jelly polish is filled with fiery glitters in different shapes sizes, and colors. 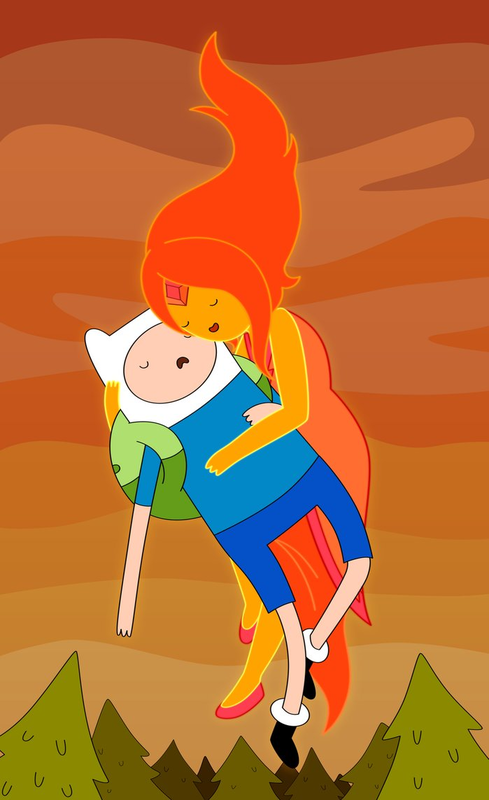 Here is Finn and Flame Princess. Next up, we have Pep in your Step. This one coat, which I kind liked how it looked!! With some top coat, I would totally wear it this way! Here is two coats of Pep in your Step with Clearly on Top by KBShimmer. This just is such a creamy white!! I love it with the red. Chels describes it: Pep in your Step is a fun and charming polish based off of Princess Bubblegum's little helper, Peppermint Butler. You will find it to be a smooth white creme base full of sweet peppermint goodness! Here is The Big Squeeze. This is one coat again, which is great coverage for a yellow! And then I applied a second coat along with Clearly on Top by KBShimmer. What a fun and bright yellow!!! Chels describes it: The Big Squeeze is a brightly colored polish based off of the sour Duke from Adventure Time, Lemongrab. You will find this bright yellow creme is filled with brighter yellow glitters and a dash of white. I love the white and yellow glitters in this too! It definitely reminds me of a lemon! Last, but not least, to wrap up the collection, this is House of Heroes. I started this mani with 2 coats of OPI Stranger Tides. I added a coat of House of Heroes with Clearly on Top by KBShimmer. This is my first rectangular glitter polish and it is SO funky! In a good way, of course, I love it! Chels describes it: House of Heroes is definitely a fun place to be discover Finn and Jake's world of wonder in this polish. Reminiscent of their home, the Tree Fort. You will find a range of "Tree Fort Colors" as well as some fun Rectangle shapes all in a clear base! What a gorgeous and fun collection! I hope you loved this look at the Algebraic Addition collection by Pretty & Polished!! And in case you missed above, you can purchase Pretty & Polished on Etsy or Pretty & Polished on My Shopify. You can also find out more information, upcoming collection information, along with swatches on Pretty & Polished - Facebook, on Twitter @prettynpolish, on Instagram @prettyandpolishd and at http://www.prettynpolish.com/. Don't forget, this collection releases on Monday, April 1! Have a great day!! i usually don't like orange polish in general - but Incinerate My Heart is absolutely gorgeous! I think I may have to splurge! 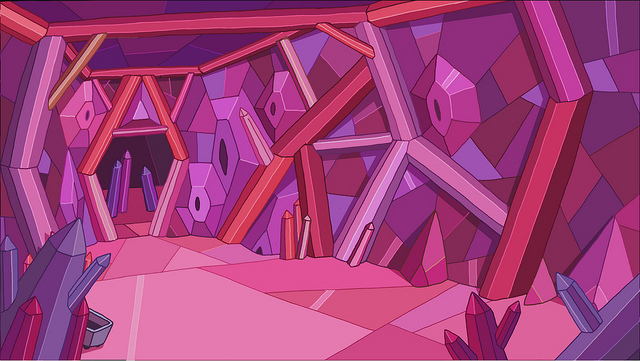 If you haven't watched Adventure Time, you really should. It has fun characters, an interesting setting, and the writing is pretty wonderful. I've found it's a show people of all ages can enjoy. I absolutely love the character colors, but I think my favorite of the location polishes is Candy Reign.